Gabe Arazo (20) sends up a jumper for Miami Trace during a non-conference game at Logan Elm Tuesday, Dec. 4, 2018. CIRCLEVILLE — Coming off a slow start last Friday in a 58-56 season-opening loss to Bishop Ready, Logan Elm coach Doug Stiverson wanted to see a more aggressive approach from the Braves in their home-opener. And what the long-time coach received was an 180 degree turnaround. The Braves scored the first 28 points of a non-league game and went on to defeat Miami Trace, 73-28 Tuesday night. Logan Elm put four players into double figures in the victory. Isaac Ward came off the bench to score a game-high 19 points. Jeremy Wietelmann contributed 14 points, five assists and three steals, Jason Sailor accounted for 12 points, six assists and six rebounds and Luke Watson added 12 points. Seven different players scored in the opening quarter for the Braves, who went 10 of 16 (62.5 percent) from the field to seize a 25-0 lead. The Braves pushed their lead from 2-0 to 21-0 by scoring on eight of nine possessions, which included knocking down a trio of three-pointers and scoring on three easy layups off turnovers or in transition. Miami Trace went 0 of 11 from the field in the first quarter, missed the front end of two one-and-one opportunities and also committed eight turnovers. The Braves stretched their lead to 28-0 before the Panthers finally reached the scoreboard on a three-pointer from Gabe Arazo a minute into the second period. Logan Elm went on to lead 43-15 at halftime and 59-21 entering the fourth quarter. 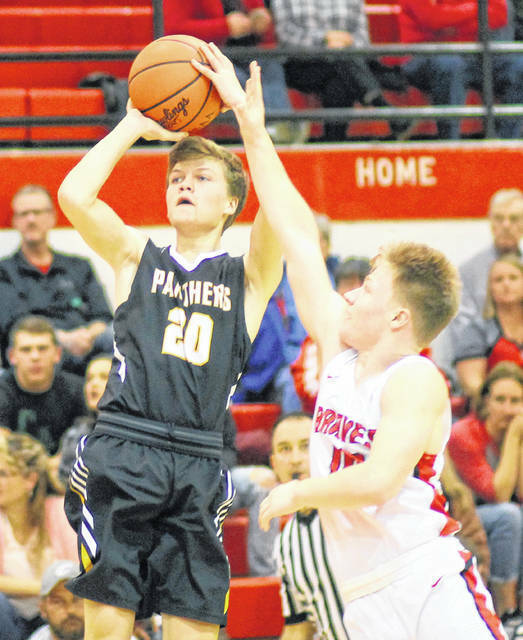 “We were concerned about Miami Trace’s height coming into the game, but our kids were active, were in good position and hustled for rebounds to be able and do that,” Stiverson said. Dylan Bernard had nine points and Arazo added eight to lead the Panthers. The Braves (1-1) open Mid-State League Buckeye Division play on Saturday when they host Liberty Union. Miami Trace (0-2 overall) opens Frontier Athletic Conference play at Chillicothe Friday with the freshman game starting at 4:45 p.m.
MIAMI TRACE — Moore 3-0-6, Mathews 1-0-2, Bernard 3-2-9, Arazo 3-0-8, Conn 1-0-2, Brown 0-1-1. Three-point goals — Arazo (2), and Bernard. Total — 11-40 3-9 28. Free throw shooting: 3 of 9 for 33 percent. Field goal shooting: 11 of 41 for 26 percent. Three-point field goal shooting: 3 of 13 for 23 percent. Rebounds: 18 (4 offensive). Assists: 6. Steals: 6. Blocks: 6. Turnovers: 24. Personal fouls: 9. Bench points: 8. Second chance points: 0. Points off turnovers: 2. LOGAN ELM — Watson 6-0-12, Wietelmann 5-2-14, Baldwin 2-0-5, Ward 6-3-19, Sailor 5-1-12, Chalfin 4-0-9, Harrington 1-0-2. Three-point goals — Ward (4), Wietelmann (2), Baldwin, Sailor and Chalfin. Total — 29-58 6-7 73. Free throw shooting: 6 of 7 for 85 percent. Field goal shooting: 29 of 57 for 50 percent. Three-point field goal shooting: 9 of 21 for 42 percent. Rebounds: 33 (10 offensive). Assists: 18. Steals: 15. Blocks: 2. Turnovers: 12. Personal fouls: 17. Bench points: 26. Second chance points: 18. Points off turnovers: 14.